The Militant Angeleno, as you may or may not know, is fond of retracing the lost waterways of Los Angeles. In April of 2008, he won several awards (okay, he didn't win any, but his blog sure got a lot of hits) on discovering Sacatela Creek, which ran from Los Feliz to Koreatown. A couple months later, he found Arroyo de los Jardines, which runs from Hollywood down to Mid-City, some of it still visible. He thought there weren't any more rivers to retrace...until now. School may not be starting up for another few weeks at UCLA, but you're about to get your first Militant History 101 lesson (and you don't even have to be a registered student to learn!). Whether you're an incoming freshman, a senior about to graduate next Spring, working on your master's or Ph.D, there's a lot you may know, but what you Bruins may not know is what lies under the very ground you walk on. 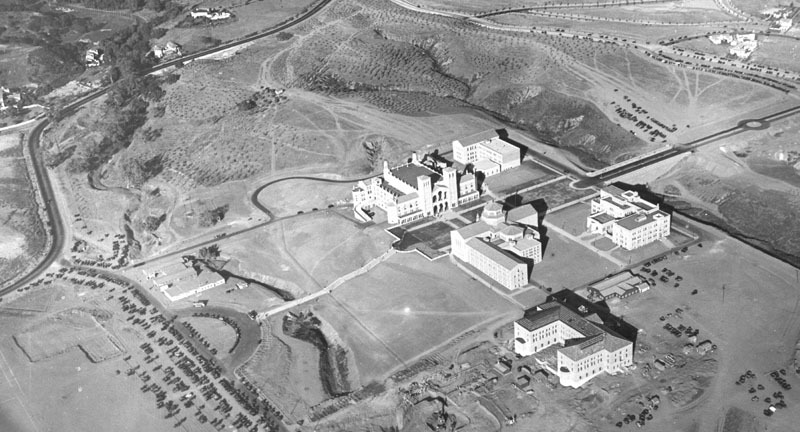 When UCLA ditched its original campus on Vermont Avenue (now Los Angeles City College) in the late 1920s for a much larger space, originally called the "Beverly Site," it left the bustle of the city for a quiet, serene meadow land near the foothills of Santa Monica Mountains. The first freshman class at UCLA arrived to a campus of all but five buildings - the landmark Royce Hall being one of them - and a terrain of streams, creeks and arroyos. Yes, rivers once ran in Bruin Land. But where did they go? There were four waterways that ran through the UCLA campus - all north from the Santa Monica Mountains down south eventually towards Ballona Creek - just like the other two rivers that The Militant retraced. There was (from west to east) the West Arroyo, Foothill Stream, Stone Canyon Creek and East Arroyo. West Arroyo ran through where the student housing complexes now stand. Foothill Stream ran just west of Drake Stadium. The arroyo was filled in in 1947 to make way for Dickson Court and more campus buildings, such as Schoenberg Hall. So what happened to the bridge? Oh, it's still there. See the low wall running across the middle of the picture above? That's the bridge! Yes, it's still recognized by the State of California as a functioning bridge, complete with weight limit restrictions (pictured left, ya rly) and periodic seismic inspections. As for Stone Canyon Creek, it's still very much a creek, starting up in the Santa Monica Mountains, running down parallel to its emponymous road, making its presence in the front yards of more than a few Bel-Air homes. For even in the Summertime, the water still flows, just as it always has been, even before the university arrived here. Come see it for yourself sometime! And then, just like that, the waters unceremoniously enter a storm drain (pictured right), never to reflect light again, at least until it gets dumped into a concrete channel just south of Westwood en route to Ballona Creek. Class dismissed. You will be quizzed next week. Professor Militan Tan-Geleno will be available after class in his office for any questions. In the meantime, The Militant seeks his next lost river adventure! 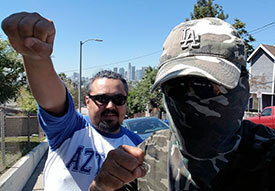 Militant props to the L.A. Creek Freak and UCLA alum Loteria Chicana for providing a couple leads towards the research of this blog post! Commandeered by Militant Angeleno @ 7:22 AM 13 comments: Hyperlinks, yo!